I am home from Sew South and definitely have a Sew South hangover. It was an incredible weekend full of friends, chatter, deep conversation and lots of sewing. But I can't think clearly enough to tell you all about it yet, but promise I will do a full recount of each day at Sew South, soon. I thought today I would show you the Dotty Pouches I made to be given away to a few friends. Lately I have been very lazy and have been using iPhone or iPad photos to post to my blog. This time I used the DSLR with the 50mm 1:1.4 lens and the difference in the photos is like night and day. Don’t get me wrong, I love my iPhone and it is super convenient for taking photos, but a real camera I still think is an invaluable tool. This is just such a great tutorial written by Lee Monroe. You can find the tutorial here. I can't say enough about Lee's teaching method. She writes a pattern that is clear and easy to understand. I love these in linen, but know I will be making many more. I especially like the last one I made with a metal zipper and a cute charm pull. I combined the Mochi Dots with that great text print from Sweetwater. The Mochi Dots fabric is high on my priority list to re-order, since I used almost my entire fat quarter stack to make these pouches. It has a great feel and sews up beautifully and it is the perfect weight for these pouches.I used Thermolam to give the pouches some great structure. About 18 months ago I bought an entire bolt of Thermolam, thinking I was buying the fusible version, but when it arrived I had ordered the non-fusible. 505 basting spray has come to my rescue many times and I almost prefer it over the fusible version now. Getting back to real life after a weekend of girl time might take me a few days. We are starting a bathroom remodel which is adjoining to my sewing room. I have to relocate my sewing supplies and fabric so it does not get covered with dust. My sewing time might be shortened for a few weeks but I will hopefully be able to sew in the dining room, like I used to do, until all the construction is finished. These are darling, Di! Love the mochi - really need to add some to my stash! Cute pouches. I like the piping in the center. I love the pouches, I might have to check out the tutorial. I have a bunch of those fabrics, this is a good application. Sure love the custom touches on these pouches. Thanks for pointing out the tutorial. Spots are one of my favourite fabrics so I simply adore these! I really should use my camera more too! The phone is just so convenient, isn't it? They look stunning - thanks for the link. 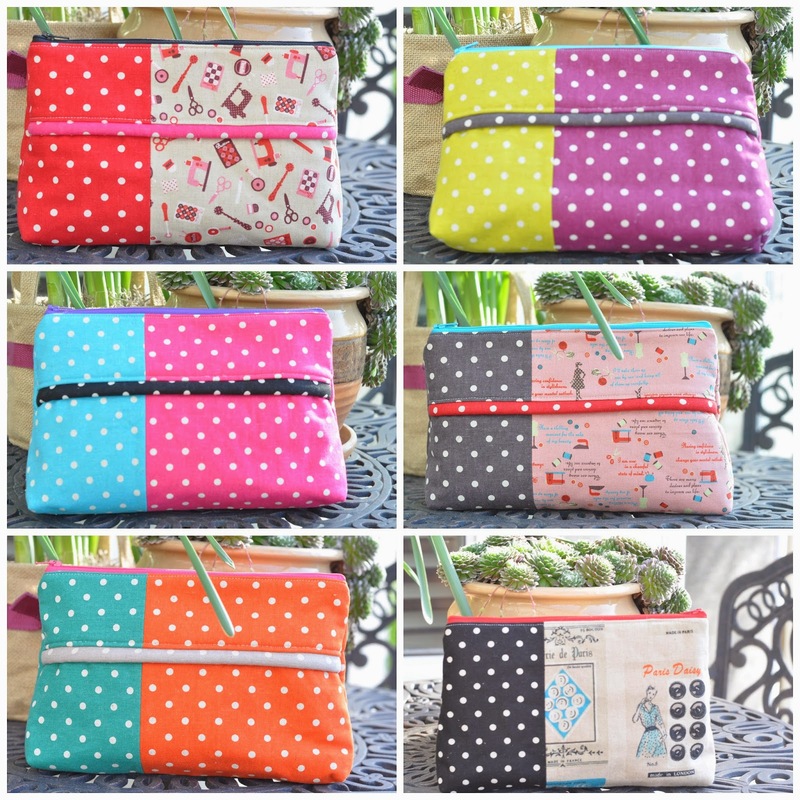 Fab wee pouches, love those dots! The pouches are gorgeous. And I am glad you had such a good time away. Now you need to get outside and away from the upheaval though. Dust and noise. Ick!